• Complete layout and measurement projects by yourself. 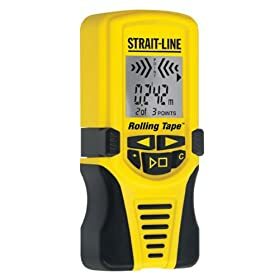 • Simply roll on a surface to measure in 1/8" increments over 300 ft.
• Adds measurements and computes even spaced points for precise layout. It does the math! • Auto marking, no need for pencils and it keeps the surface clean. Complete layout and measurement projects by yourself. 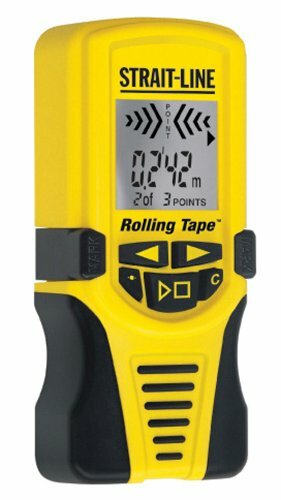 Simply roll on a surface to measure in 1/8" increments over 300 ft. Adds measurements and computes even spaced points for precise layout. It does the math! Auto marking, no need for pencils and it keeps the surface clean. to be a good choice. Works great. Got the job done in less than five minutes. Tip - Save yourself some bucks, this device can be found at Home Depot for $20 dollars. For the person who rated this a 1 star i would suggest you pay attention. I went to the Christmas Tree Shop to pick this "Exact Same unit" as you said in your review. Turns out it is laser measurement device but very severly short of features and accuracy compared to the unit in review here. It is only good to 1/2" compared to the 1/16" of this unit. You caused me to waste a trip. I ordered from Amazon the same day and the unit is awesome. 1) It's a little too light. 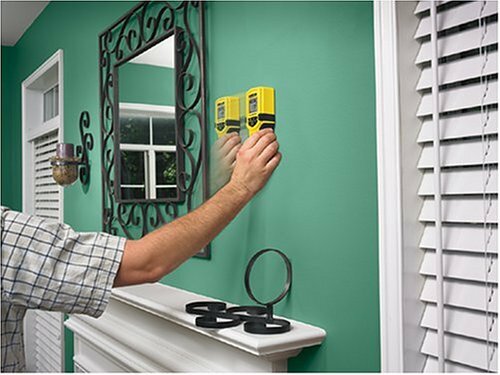 When you reach the end of your measure and want to mark or change settings, the light weight makes it a bit too easy for the device to move around on you in a random fashion, throwing off your measurement. 2) The markers aren't particularly useful. They only work on drywall, and the dimples they make are difficult or impossible to see if there's a texture. Also, the shape of the markers combined with the unit's light weight makes it difficult to use the markers as a stopper to help measure right against an edge (as instructed in the manual). 3) My bigger complaint is that the unit uses roller bars for measuring. Like older ball-type computer mice, these rollers tend to get gunked up with use (and while mice are generally used on a somewhat clean desk or pad, this device will typically get used on walls, ceilings, and other materials that are quite dirty and may even have a loose texture). Better would be to go with an optical LED system, just like computer mice did. Heck, they could even have a higher-end version that uses a laser pick-up. All-in-all, I think this is a great device. I have absolutely no problem doing the math involved in hanging things, but this device just makes the process so much quicker and easier - almost fun. Now, when I have a project at my MIL's, this is one of the first tools that I grab. That said, for my own money, I think I'll wait for an updated version with an optical scanner instead of a mechanical one. Really great product. The marking buttons on either side are accurate and leave a discreat indentation in the wall. Not difficutlt to use and well worth the $8 I paid, would pay alot more. I'm good at math but this is still alot faster and more accurate. This is Not a Precision Instrument. This is not a precision instrument. Use it for rough estimates only. It is good for what all of the other 9 reviewers used it for, however, it can be off as much as a half inch. There doesn't seem to be anything wrong with my unit, other than I get varying measurements. If the measurements were at least consistent, then it wouldn't matter what the numbers were, but I measured the same wall 6 times and got 6 different results. Like I said, if you are just hanging shelves or pictures and want them evenly spaced, or even if you want to find the center of the ceiling, this unit will work as long as you don't mind that it will be a little off. If you are making the shelves yourself, use a tape measurer. I have used this product for 2 years. It is innovative and very useful. The unit is very accurate and very good on either flat or round surfaces. It's ability to measure and divide a measurement into equal parts then mark those measurements is truly useful and a time saver especially if you are not good with fractions. I have used it to measure circumferences like drums and divide them into equal parts. If I had to suggest one improvement it would be to make the rollers that do the measuring run the full length of the unit. That way you could measure narrower objects. Hanging pictures, great. Measuring, not so great. This product makes deciding how to hang photos and the like at equal intervals very easy. It is not, however, all that great for measuring the dimensions of a room. I found it difficult to use (especially because at a corner, you have to pick it up and place it on the other wall (so it's not going to be accurate; you'd have to add however many inches it had left to go on either side)). Considering I bought it for both, I'm quite a bit disappointed. Good idea poor design. I feel like I need to complete my PHD before I try to use it again.